Watching Snow White and the Huntsman was something of a surprise for me last year. I skipped when it was in the theater and only watched by happenstance. It looked bad. Then I picked it up on a whim out of a bin and was pleasantly surprised. It isn’t exactly good, but it is much closer in tone to the sort of 80’s fantasy movies I loved rather than something more like Lord of the Rings. As someone who grew up on Willow, Legend and Ladyhawk, it was something of a mild delight. 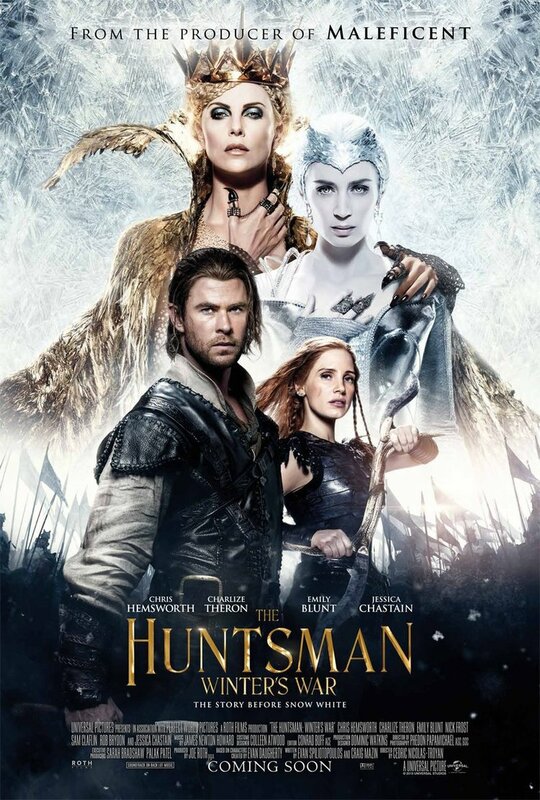 The Huntsman: Winter’s War dropped the worst part of the first movie, Snow White, and added in a couple of really entertaining actresses. I wasn’t quite excited to see it, but I was slightly eager. The Huntsman: Winter’s War is not a great movie, but at its best it is completely charming and fun way to spend an afternoon. The Huntsman: Winter’s War starts as a prequel to Snow White and the Huntsman with a dull opening half hour or so. It is not the worst thing ever, but it moves without life or energy as they set up Freya, who is essentially Elsa from Frozen. After that, it jumps ahead to after the first movie and gets picks up quite a bit. Instead of the full seven dwarves, this pares it down to two, at least for starters. Two with personality. Eric, the Huntsman, quickly gets a quest and is soon joined by his supposedly dead wife. It never breaks out of being a generic fantasy adventure, but it also never really tries to. It is content to let its largely fun characters play off each other on a series of small adventures that culminate in an epic showdown with two evil queens. Chris Hemsworth is at his most charming in this movie, being the only well-adjusted protagonist. He smirks and saunters through the movie like a slightly off brand Harrison Ford. Jessica Chastain plays his stoic badass of a love interest. Nick Frost, Rob Brydon and Sheridan Smith are delightful as comic relief dwarves. The only disappointments are Emily Blunt and Charlize Theron, though that disappointment is not fault of the actresses. Theron continues to chew scenery are the unrepentantly evil queen Ravenna, but her role is small and her motivations completely lacking. Emily Blunt, meanwhile, is stuck between being a full villain and just being misunderstood, coming off as weak and flat. The biggest problem I had with the movie is the ending. It sidelines so many characters for an ultimately unsatisfying fight. Ravenna steals the show at the end, but that mostly shoves all the characters that had been a part of this movie from the start off the screen. Some characters just disappear for the whole climax, essentially forgotten until it is over. The two protagonists, whose love is the central plot line of the movie, barely interact during it. It flails about and gets the job done, but in a wholly disappointing way. Still, I like The Huntsman. The beginning and ending might be a mess, but that middle is oh so sweet. This is the kind of movie I would have fallen in love with renting the VHS from the grocery store as a child. It isn’t the best thing ever, but it also isn’t stupid or outright bad. It is a mostly okay, wholly generic fantasy movie. Sometimes that is enough.